All transactions are safe and secure with a reliable history in online purchasing behind each of our associates. 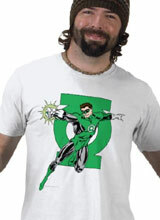 Buy the DC Comics Green Lantern t-shirts to own Green Lantern clothing and merchandise. The DC Comics Green Lantern t-shirt shown here features the hero in front of his logo symbol wielding his power ring to battle evil. Hal Jordan was the first Earthling to become a part of the force and do good for the Guardians of the Universe. His ring transforms his willpower into green energy that protects him and others against evil. Catch up on his heroic tales with merchandise from below, or get a Green Lantern suit costume to celebrate the movie and further embody the superhero. In addition to the DC Comics Green Lantern tees above, browse the Green Lantern Clothing Gallery for more apparel like men's and women's clothes, kids shirts or hoodies.